Do you have a child age 3 years to 8th grade? Looking for a fun holiday activity for them to participate in? The SLSPA Dance Conservatory is holding a kids camp for their production of Magic Scarf on December 1st. For $15 your child can come to a fun dance camp from 9:30 am- 12:15 pm. They then perform their dance at the 2:00 matinee of Magic Scarf. Dance Conservatory is putting on a holiday show called Magic Scarf. For $15.00 your child can attend a dance workshop, get a Christmas hat, and perform at our December 1st show at 2:00 pm! The children will come and learn a dance taught by the SLSPA Conservatory Dancers, on Saturday, December 1st, from 9:30 am to 12:15 pm. Parents, family, and friends that would like to see their children perform, will need to pay a $3.00 admission fee. WHEN: Practice Saturday, December 1st, 2018 from 9:30 am to 12:15 pm (with a one hour lunch break with parent(s) from 12:15-1:20). Perform: Saturday, December 1st, 2018 at 2:00 pm. 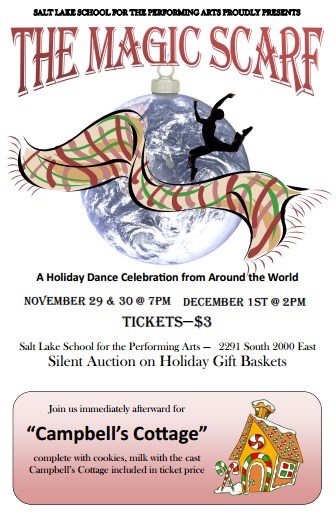 Come and join Salt Lake School for the Performing Arts Dance Conservatory and have a BLAST!! Come and be a part of the elf ensemble!